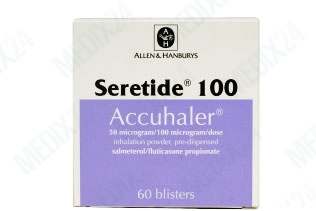 Seretide contains two ingredients: fluticasone and salmeterol. Fluticasone is a steroid, steroids are used to help reduce inflammation. 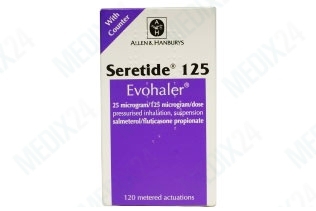 Salmeterol is a long-acting beta agonists which helps relax the air passages in the lungs. The combination of these two ingredients helps in the treatment of asthma and COPD. 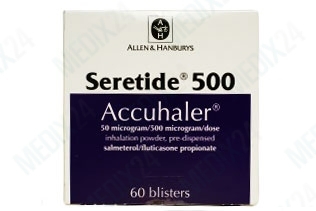 Used for treating: asthma and COPD. Active ingredients: salmeterol and fluticasone propionate. Effect: easier breathing, less swelling and irritation in the lungs. Seretide helps to prevent asthma attacks when you use it regularly every day, even when you think your asthma is under control. It will not give you relief once an asthma attack has started, then you must use your fast-acting reliever inhaler to relieve an attack of breathlessness or asthma. 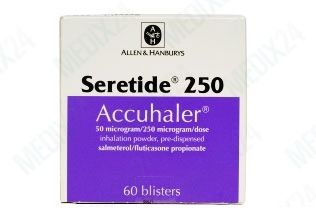 When you are pregnant or breastfeeding, a physician must determine whether the use of Seretide is suitable for you. You must always take care to include any medications you use on the medical questionnaire when you order with Medix24 so it can be determined whether you may use them in combination with Seretide.